← June 30 Corn Nitrogen Update! It has happened to us all — plans were coming together beautifully and then one trifling detail derails the whole operation. You get to the deer stand on opening day of hunting season and you realize that you left the ammunition (and/or lunch) on the roof of the truck – before you left home. Or, you get halfway to the lake for a rare and highly valued fishing venture with eager youngsters and a quick glance in the review mirror reveals that (for whatever reason) the boat is not there. Years later, you laugh (or not). Farmers are used to getting foiled and generally expect the unexpected: things break, animals get sick, employees don’t show up on time, and weather fails to be optimal. One less common but no less frustrating way that plans can get spoiled is related to pesticide and those bothersome ‘replanting restrictions’ that accompany herbicides. For example, you might want to rotate a corn field to grass for a few years, but you discover that the labels from last year’s herbicide cocktail says you can’t! The herbicide label describes which crops can be planted and when following the application of a particular pesticide. These restrictions are not recommendations, they are the law. Why it is the law may be related to potential harm to subsequent crops caused by persistent herbicide activity, or it may be related to known or unknown issues related to pesticide residues that could make a crop (or milk/meat from animals that ate the crop) unfit for human or livestock consumption. The simplest questions you can ask to avoid this problem are 1) what do I want to plant in this field next year? 2) Will the herbicide program that I am planning to use this year allow me to proceed as planned? If not, you need to find out a product that will allow you to follow your desired course of action. The same challenges can occur if you hope to harvest a cover crop (e.g., rye or triticale) as a livestock feed. Some herbicides used in corn production systems do not allow for planting winter rye or certain other cover crops. While the label is the law, state Agency of Agriculture regulators have legal authority to interpret the label. 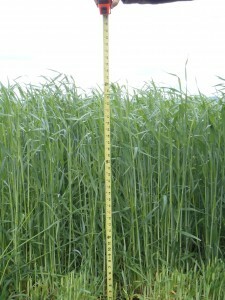 In regard to this issue, Cary Giguire, of the Vermont Agency of Agriculture has confirmed that cover crops in Vermont CAN be planted even when the rotation/replanting restrictions on the label seem to disallow it — as long as 1) the farmer is willing to accept the possibility that the stand will be reduced due to remaining herbicide activity; and 2) the cover crop will not be fed to livestock. The Vermont Agency of Agriculture essentially considers such a crop to be ‘manure’ and not a crop. If you want the option of feeding the cover crop, you and your custom applicator need to plan to use a weed control program that will keep that option open. ‘Do not rotate to crops other than corn (all types), cotton, small grain cereals, soybeans, sorghum or peanuts the spring following application of Lumax®. For all other crops, wait 18 months. It is a very good idea to always ask the custom applicator what the replanting restrictions are and then for you to verify it. Your custom applicator or consulting agronomist should be able to furnish you with a label and, if asked, mark the relevant sections to address your questions. Verification is recommended not because anybody will try to mislead you, but because we all occasionally forget, misunderstand, and make mistakes. Labels for most agricultural pesticides can be found at http://www.cdms.net/Label-Database . Whether you open them in your web-browser or Adobe, they should be word-searchable, and that should help you find the section of the label that you are interested in. Terminology varies among labels, so use search terms such as ‘rotation,’ ‘replant,’ and ‘restriction.’ If you can’t find it using search terms, make yourself a cup of coffee and read the whole label! Or call your local Extension Agronomist to help you find the appropriate section. A little due-diligence with herbicide selection can save a lot of time, frustration, and, in some cases, financial loss. This entry was posted in Uncategorized and tagged cover crop, feeding cover crops to dairy cattle, herbicide carryover, herbicide label, herbicides, Lumax, rye, rye cover crop, triticale. Bookmark the permalink.